The Bedford Falls Sentinel - An It's a Wonderful Life Blog: Back to High School, Bedford Falls High School that is. Back to High School, Bedford Falls High School that is. 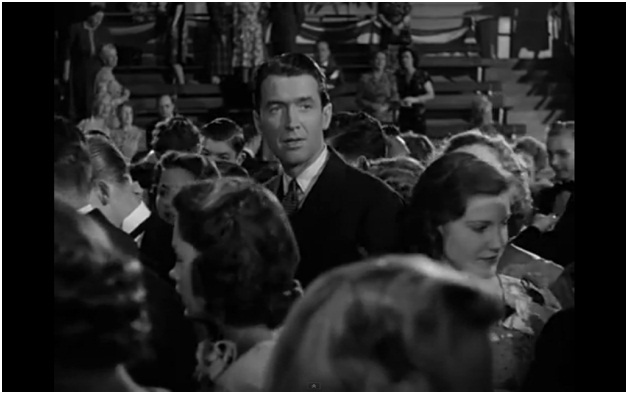 Jimmy Stewart was almost 40 years old when It's a Wonderful Life was made. Taking a look at the high school, and it's scenes in the film it's worth noting that Stewart had to pull off convincing us that he's almost half his actual age. For the 1928 graduation dance held for his younger brother Harry's senior year we have to assume that George is around 22 years old. He half heartily attends the dance, but quickly finds himself surrounding by many of his old friends. Sam Wainwright pops in, and Marty Hatch comes in to interrupt Violet attempting to get George to make a bid for a spot on her dance card. (Side note: Sam mocks younger Mary's by repeating things she used to say when they were younger. 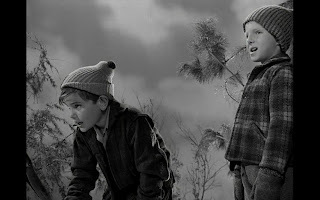 A scene cut from the movie, was of younger Mary, calling for Marty to come home slightly before young Harry falls through the ice) Marty comments on the reunion as being an in prompt to 'old home week'. We briefly see Marty earlier on the sledding hill at the opening of the movie, played by the young Danny Murmmet , and now as adult by Harold Landon. 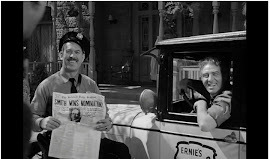 Landon played various bit parts in even more various film and television up until his last role in another of my favorite Andy Griffith episodes in which Barney purchases a motorcycle and side car. I've not been able to locate him as a townsperson in it yet, so drop me a line if you can. Marty is of course Mary's older brother and probably on behalf of her asks George to dance with her. Already aware that she is in love with George and always has been (from her own words in Gower's store) we have confirmation of this again when Marty mentions the dance would give her the "thrill of her life". 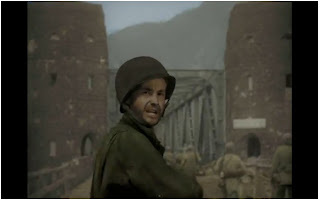 Marty is again mentioned with distinction of having participated in the 9th armored division's capture of the Ludendorff Bridge at Ramagen in 1945. Landon outlived his younger version of Marty by almost 30 years, passing away in 2002. It's on the famous Gym floor of Beverly Hills high school that we see those famous looks from George and Mary as they see each other. George has known Mary likely most of his life, although from his face we can tell that something is different. Again, it's common knowledge that the suitor George brushes off to dance with Mary, is the famous Alfalfa from the Little Rascals. Cast as Freddie Othello (in a nod to the believed scorned Shakespeare's othello) , Carl Switzer who has the role which latter triggers the famous pool scene. Switzer received many roles over the years but later died tragically in an odd and still controversial fight near his home at age 31. As he's brushed aside, Mary and George start their famous Charleston dance. The Charleston dance craze was at its peak in 1928. The Bedford Falls high school is known for its floor more than anything else. Given credit for the idea in the film, George and Mary are the first to fall victim to the ingenious idea of a pool hidden beneath the court. In actually, the real floor was (and is) of course the nearby Beverly Hills High School famous 'swim gym'. 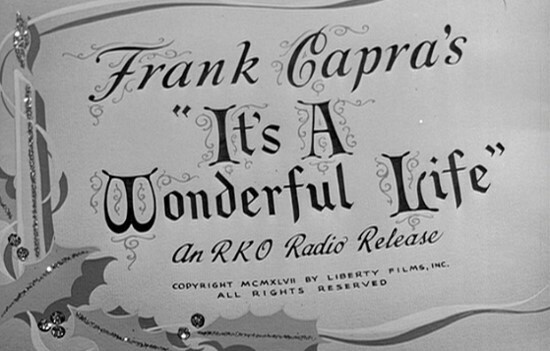 A nice article detailing the gym and its role in It's a Wonderful Life can be found here, and near the end is a short clip of an interview with some of the Bailey kids on the actual floor. A great scene, what I remember and love most about the entire section is the fact that after falling in, George and Mary are still dancing away while Mary looks so happy. The High School scene also highlights Harry Bailey as well, telling us first about his exploits on the football field and foreshadowing some of the reasons George decides to give his brother the savings from which to go to college rather than George. 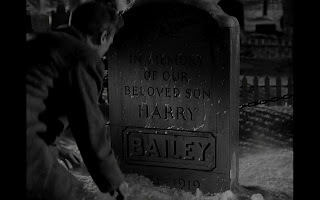 Harry Bailey has always intrigued me, for it is him who utters the toast at the end of the movie which is my favorite part of my favorite movie. Harry is played by Todd Karns here, and by Georgie Nokes when younger. Karn's father was a lesser known actor himself who is most famous for his lead role in the 50's TV show Rocky King Dectectives. Todd Karn's first roles were as Harry Land on two Andy Hardy films, the second of which was the 1942 'The Courtship of Andy Hardy'. 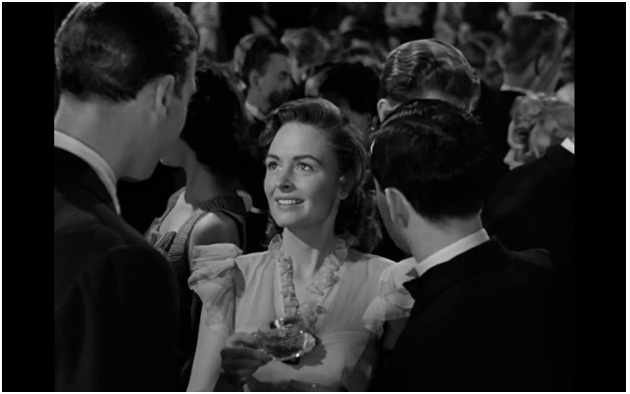 In that we see the breakout role for Donna Reed, and also a young Ann Rutherford fresh off work in Gone with the Wind. On another side note, Ann Rutherford is still alive and well. I recently was reading this article which updates us of the oldest surviving Oscar nominated actors including the likes of Kirk Douglas and Olivia De Havilland. Harry Bailey of course is the younger brother whom George saves from drowning in the movie opening. He becomes a star high school and college football player. 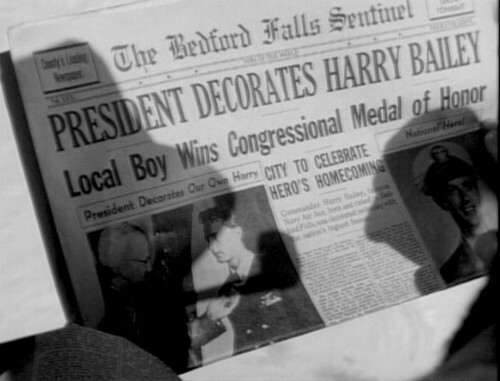 He later marries and to George's initial frustration, lives away from Bedford Falls. He goes on to win the medal of honor as a navy pilot during the Second World War. He dramatically saves hundreds of lives by downing an enemy plane attempting to sink a troop transport. And of course it's him who delivers that toast of toasts, settling once and for all who is the richest man of Bedford Falls. (See background!) Side note alert. Harry might not have all fans for some of his actions throughout the movie as I discovered this mildly sarcastic but well worth reading post concerning the youngest Bailey brother. So that's from our look at the inside of the Bedford Falls High School, here is Enesco's look and take on the outside. The Bedford Falls High School is from the 3rd series of the village. It's the first of four from that series. Here is the box views. The High School is one of the taller buildings in the series so it can be placed behind some of the shorter ones while still remaining visable. I normally don't put it on the main street as it seems like in the film that it's not connected to those stores we see in many background shots. As Mary and George are walking home, they seem to be in the residential areas so I typically put it to connect the homes and commercial parts of the village. Enjoy. Enesco Bedford Falls High School: Clock front. Probably the best feature on this building. Enesco Bedford Falls High School: Back view is pretty standard. I do like the gray concrete foundation to offset the red brick. Enesco Bedford Falls High School: Other side view. Like the snow build up on the ledges. Enesco Bedford Falls High School: Angle. Lots of trees around this one. Enesco Bedford Falls High School: Top all snow covered. Clock tower roof is nice. And of course all lit up. This one doesn't have the patterns some of the others do, but it's height again create a nice backdrop when seen with the rest. I wish a better light would have been projected through the clock face. Enesco Bedford Falls High School: Angled view. Enesco Bedford Falls High School: Notice the need for some additional light in the clock face area. Freddie Othello: "Hey, this is MY dance! " George Bailey: "Oh, why don't you stop annoying people." Freddie Othello: "Well, I'm sorr- Hey!"